July 2, 2013: WorldLoop together its key founding partners Recupel and Close the Gap, invited key European stakeholders of the e-waste broader ‘sustainable’ ICT for development discussions to Nairobi, Kenya to witness first-hand how ICT projects for social and economic inclusion could be done in a sustainable and e-waste neutral way. Delegates, as professionals knowledgeable in the realm of e-waste, entrepreneurship, business and as supporters of development projects, were asked to provide key input and reflection on the e-waste situation they saw unfold before them over the course of the journey. Delegates met with key local stakeholders including beneficiaries of ICT4Dev projects, UNEP officials, recyclers who engage in the informal recycling industry and management and staff of the WEEE Centre, WorldLoop’s project in Kenya. The trip started with a visit to an ICT for development at Our Lady of Nazareth Primary School, an ICT for development project which Close the Gap has supported by providing the computers for a computer lab. 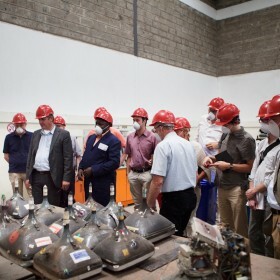 Following a visit to the United Nation’s Environment Programme’s headquarters in Nairobi, to further understand the growing e-waste challenges facing developing countries, the delegation had an opportunity to visit the Ngara Market, one of the many markets of second-hand and hand-made goods that are so common in Africa. Here, as the party weaved through narrow pathways of shacks and storefronts among the hanging cables, rows of old remotes and cast aside computer casings, we had an opportunity to chat with the entrepreneurs who are making their living off of refurbishing and reselling this equipment. Next stop on the trip was to visit the WEEE Centre, an e-waste recycling centre which is receiving support from WorldLoop. Here was an opportunity to witness a cleaner, healthier and more environmentally friendly way to manage the e-waste fractions similar to those seen at the Ngara Market, a mere 10km away. Witnessing the progress the WEEE Centre has made since its inauguration with Neelie Kroes back in 2011, it is encouraging to see what the coming years will bring for ICT projects with a sustainable solution for its end of life hardware. While the journey started on a truly inspirational note, witnessing the positive impact ICT equipment is having on young children’s lives, equipping them for better success in secondary school and beyond. It was sobering to see the realities of how the informal industry operates. The ability to engage with these artisans, providing them the support, services and skills to better practice their trade, in safer conditions is what WorldLoop and its stakeholders continue to strive for. Participants included representatives from Recupel, Feebel, Hitachi Powertools, Federauto, DNS.be, WeCycle, Witgoed, MNVP, Dell and Rabobank.